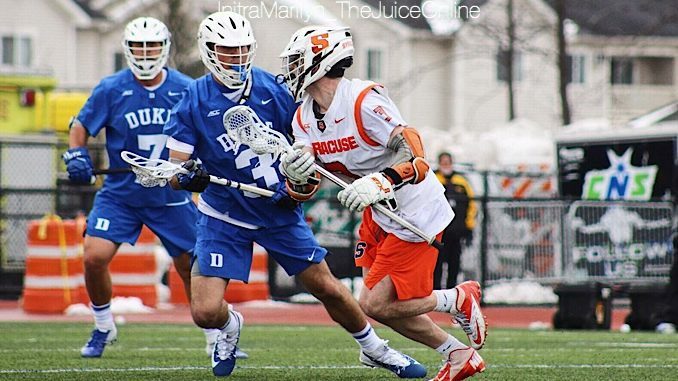 Syracuse lacrosse plays against Duke. Mandatory Photo Credit: The Juice Online, Initra Marilyn. The top seed is set for the upcoming recalibrated ACC lacrosse tournament beginning with the first-round game April 25 at North Carolina, bur after that the seeds are up for grabs. Virginia is 3-0 in league play clinching the No. 1 seed, with a huge game at Duke Saturday. The Blue Devils are 1-2 in the conference tied with the Syracuse and Notre Dame. North Carolina is 1-1 hosting the ‘Cuse also on Saturday (3:00 p.m. ET / ACC Network Extra) before finishing at Notre Dame April 20. This year the No. 4 and No. 5 seeds meet in the first round ACC game, the winner advancing to face the top seed, Virginia, in the semifinals on April 27 at UNC. The No. 2 and No. 3 seeds meet in the other semifinal that day, with the winners playing in the championship game the following Saturday, May 4, on the field of the highest remaining seed. For Syracuse to have its best chance to host that title game a couple of things have to fall into place before tiebreakers come into play. SU must beat North Carolina to finish 2-2 in conference, have Virginia beat Duke and then North Carolina defeat Notre Dame to close out the regular season and finish as the No. 2 seed. The Orange would have to defeat the No. 3 seed in the semifinal and have the No. 4/5 winner upset Virginia to host the championship game in the Dome.